Does This Steve Reich 9/11 Album Cover Cross The Line? : Deceptive Cadence As the 10th anniversary of Sept. 11 draws near, one album cover courts controversy. Does This Steve Reich 9/11 Album Cover Cross The Line? Late yesterday afternoon, Nonesuch Records posted the album cover image for the upcoming Steve Reich recording — and it is already sparking controversy. The photo, which appeared on the website Sequenza 21, and then on Nonesuch's own site, is a graphically enhanced version of Masatomo Kuriya's shot of the second plane approaching the World Trade Center's twin towers on Sept. 11, 2001. 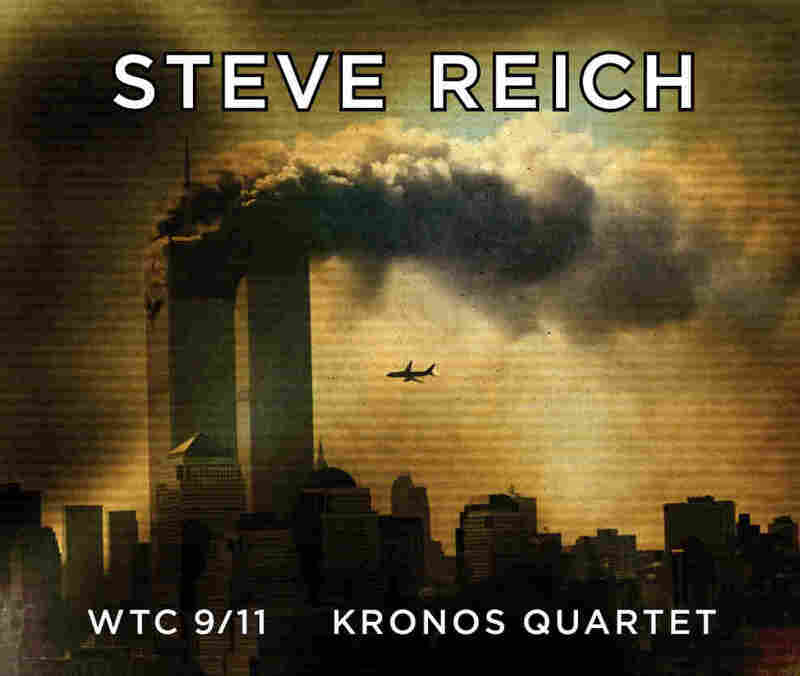 The album, to be released Sept. 6, contains Reich's new work WTC 9/11, performed by Kronos Quartet. Few would say that the image isn't provocative; others have already posted strong reactions. With the 10th anniversary of Sept. 11 just around the corner, my Manhattan-based colleague Anastasia Tsioulcas and I thought a brief discussion might be appropriate. Tom Huizenga: Anastasia, just since late yesterday, this album cover has already provoked very strong opinions on the Web. Anastasia Tsioulcas: It certainly has — and most of the reaction online has been very strongly negative. The composer Phil Kline — who has written his share of politically provocative music, including 2003's Three Rumsfeld Songs and Zippo Songs (the latter with texts that American GIs in Vietnam scratched into their lighters) — wrote on Nonesuch's site: "I think you may have broken new ground. This is the first truly despicable classical album cover that I have ever seen." The critic Seth Colter Walls summed up that reaction succinctly on Twitter: "NYC deserves better, and so does the piece." But one respondent on Sequenza 21, Paul Muller, wrote : "I've only heard a few excerpts, but given the graphic nature of the cover and Reich's comments about that day, this would seem to be a work that puts you in the historical moment. We need to hear what Reich has to say about this event musically – but I think it will form part of a large dialogue: What power does/should this event have over us ten years later?" TH: Yes, Muller poses a good question. Some might say enough time has passed, and that an image like this, albeit disturbing, is appropriate to the music – depending, I might add, on what the composer might want us to be thinking when we hear the music. Anastasia, you heard the New York premiere of WTC 9/11 back in April, what did you think of it when you first heard it? AT: I thought it was a powerful work that evoked some extremely painful and disquieting memories — not to get into comparing suffering, but many of us at Carnegie Hall had very direct and visceral ties to the events of that day. For me, a big part of the piece's affect and effectiveness is Reich's interweaving of recordings of NORAD air traffic controllers and FDNY workers on Sept. 11 with recorded recollections made years later by Reich's friends and neighbors in lower Manhattan — the binding of past and present. What are the lines between news or current events and artwork that is concerned with those events? When does art cross the line into exploitation, or even kitsch? And what is the point of such a highly provocative cover? Is it there of its own artistic or topical merit, or just to be sensationalistic — and coax sales? You mentioned to me earlier that the photo was actually manipulated, which brings up another whole host of questions and concerns. TH: I should mention that Nonesuch told me that Reich had input into the selection of this image for his album cover. It wasn't just handed down by some record exec. Anyone who was in Manhattan that fateful day, or has seen the countless 9/11 photographs and television specials, will remember what a beautiful morning it was, with its azure blue, sunny sky. Here, the cover, designed by Barbara de Wilde, features Kuriya's iconic photo darkened in a sepia hue and covered with a striated patina of grime. That is what some might call artful. Others will forcefully disagree. And that leads to larger questions such as how art embodies grief and fear. 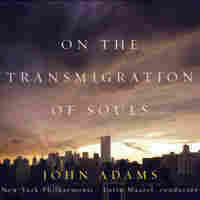 We might point to other Sept. 11-related items, like the ghostly black-on-black Twin Towers that Art Spiegelman created for the cover of the New Yorker, or if we are talking music, the John Adams album On the Transmigration of Souls (also released on Nonesuch), which sported a brooding sky over Manhattan. And some will argue that an album cover, no matter how artful or distasteful, is merely the packaging that sells a product. AT: What do you think of this cover? Is it justified, despite its disturbing nature, because it's appropriate to Reich's music? Or do you think it crosses a line? Share your thoughts in the comments section below.